I have finally jumped on the jogger pant bandwagon, and ladies I do not know what took me so long. These pants are the most comfortable pants I have ever put on my body. Kittens and rainbows and strawberry margaritas do not compare to the joy these pants bring. My hesitancy with getting on the jogger pants trend has been not knowing what to wear with jogger pants. Clearly laid back athleisure style is not my usual look. 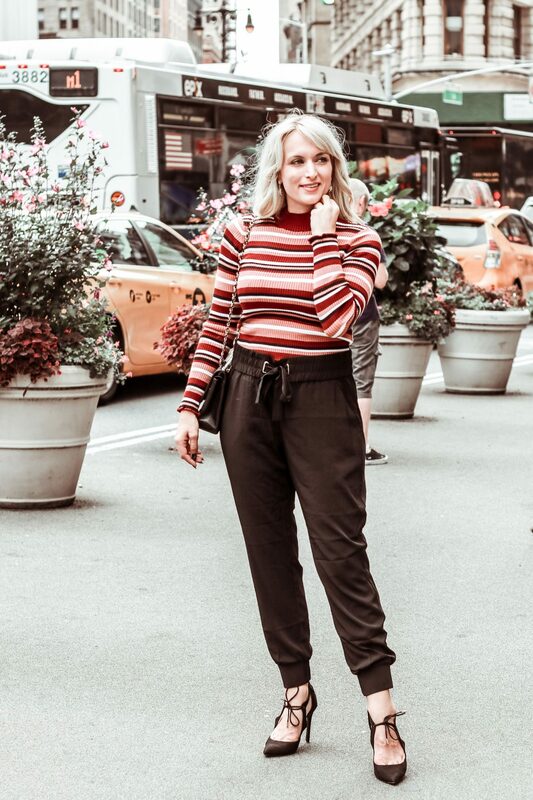 Recently though, I’ve seen fellow fashion bloggers dress up jogger pants with fancier tops, so I thought I would try wearing them and (clearly) I’m so glad I did. In my opinion, the key to styling jogger pants in a non-athleisure way, is to wear them with high heels. These suede tie up ones are old favorites of mine and I love that the lace up detail gives a nod to athletic style, but is still adding the high heel glam I was going for. This striped mock neck top is one I grabbed right before New York, and I know I will be wearing it a lot this fall. The colors, the stripes, the ribbed texture – everything about it is right on trend for fall. As you can probably tell I shot these photos in front of the flatiron building in New York. I ended up wearing this outfit around while meeting a friend for coffee and running a ton of errands that morning and I love that I felt chic but still really freaking comfortable. The one thing I will say about these jogger pants is that they will not work if you are tall. For reference, I am 5’8 and in my usual size M they were too short on me. These are a size L that I had to get taken in at the waist, but that was the only way the length worked on me. If you are 5’5 or under these will probably hit you perfectly. That’s all on this easy fall outfit. Oh, and one last time – I am so glad I figured out what to wear with jogger pants haha. Stay tuned tomorrow for another New York Fashion Week recap. I have two days left to cover and you won’t want to miss either! Cute sweater and this is a nice spin on wearing joggers! I have seen quite a few recently and like you, don’t really feel like it’s an item that I can work with. I’ll have to try them out and see if I can come to same conclusion! No doubt, I am sure they are super comfy! Aw thanks Maureen; I’m glad Im inspiring you to at least give them a try and see what you think. I think you’ll like them! Love it! I would have never thought to wear joggers with a striped top but it goes so well. I agree with you on the key being to wear them with heels. I have a crepe-y olive pair that definitely give off genie in a bottle vibes if I wear them with flats. No can do! Thanks girl! And lol thank you for the genie in a bottle reference – I just laughed out loud and snorted my coffee; too good haha!! Funny because all 4 of us are wearing joggers on my blog today too. And then on Wednesday we are going to dress them up kinda like this!!! It’s a fun trend, and I’m glad I said yes to the challenge!! Oh no way! I love that! I’ll have to head over on Wednesday to check those looks out as well! These pants are mad cute and they look super comfy!! I love the versatility of jogger pants! right?! Im so glad I finally tried out this trend. I need a pair of these joggers!!! They look so comfy! You so do! They’re great! They also come in a few other colors. such a cute outfit and i love that bag! Love how you dressed up these joggers! Super cute! I am obsessed with joggers! I love this outfit! & the shoes are perfect. This looks like a cute and comfy outfit! I am loving that striped top! Yassss girl jogger pants are my jam! Can’t beat something that’s both style and comfort! Haha my thoughts (now) exactly! Can’t believe I waited so long to try them! I just looooove jogger pants. I am not buying any because I would wear them every day lol! Hahaha I totally get that; that’s me with leggings. Whenever i’m not in suit pants for Court I have to literally force myself to wear jeans or skirts on occassion because I would live in leggings if I could.